It’s the dead heat of Summer here in the South, and while that brings some great beach days, less structured child routines, and wind-whipping boat rides in the river, one of my favorite Summer perks is fresh garden fruits and vegetables (even if they’re not from my garden). 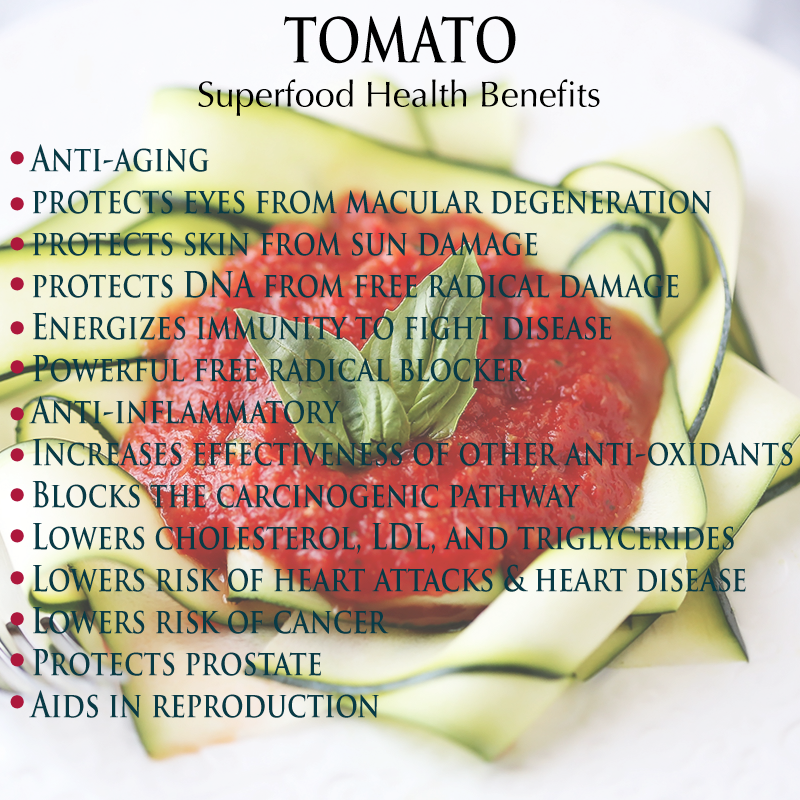 Our Superfood spotlight today is one of my absolute favorite vegetables, which is botanically a fruit, the tomato. According to the USDA the tomato was deemed a vegetable in 1893 to protect the U.S. tomato growers from rising vegetables imports so they made vegetables subject to import tariffs, but fruits were not. Thus, the tomato fruit became a vegetable. So, why is the tomato considered a Superfood? 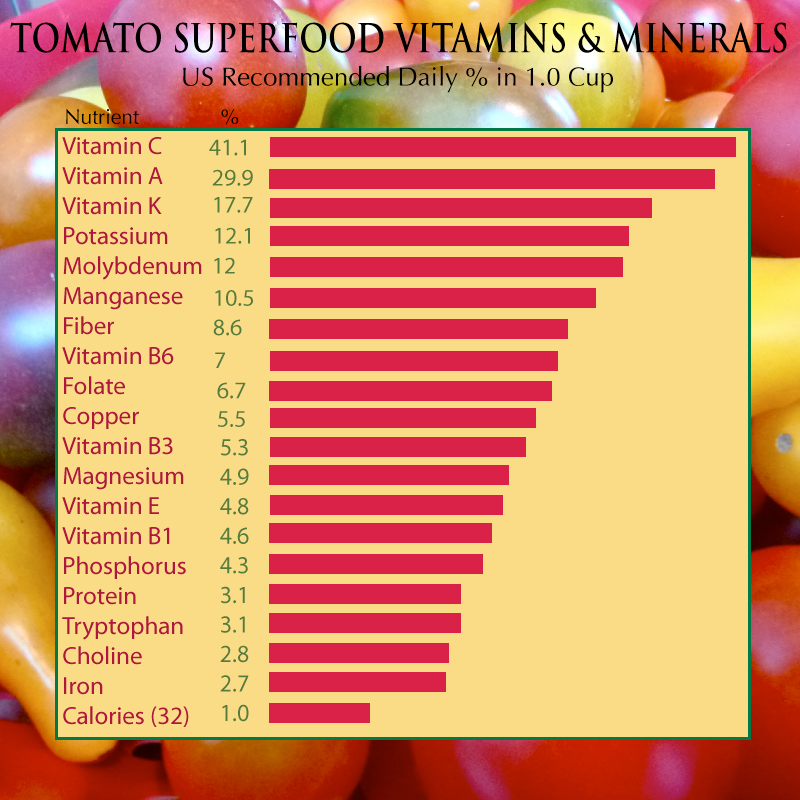 The tomato contains 19 vitamins & minerals (see graphic below), including up to 41% of the daily recommended amount of vitamin C in just 1 cup of raw tomatoes. It is also low in sodium and calories. But, what puts the Super in Superfood for the tomato goes far beyond its vitamins, minerals, fiber, and protein, and takes us to its phytonutrients. Phytonutrients (plant nutrients) are not the ones that our lives literally depend on, i.e. protein, vitamins, minerals, fats, but they are the ones that help our bodies’ to function optimally and to prevent disease and destruction. Unlike vitamins and minerals, phytonutrients were not discovered or studied until the 1990’s. We are just beginning to unlock the potential and productivity of these natural wonder-nutrients. The key phytonutrients in tomatoes provide a very broad range of extremely powerful anti-oxidants that are paramount to wellness. Most of us have heard that tomatoes are rich in lycopene, which is one of a group of pigments called carotenoids, and one of the anti-oxidant powerhouse members. These pigments are usually red, orange, or yellow, but are also found in some green leafy vegetables. The Mayo Clinic reports that many studies correlate findings in which high blood levels of lycopene decrease the incidence of cancer, cardiovascular disease, and macular degeneration. Lycopene is not the only carotenoid contained in tomatoes, in fact, it has at least 4 additionals: alpha and beta carotene, lutein, and zeaxanthin. All 4 of these carotenoids are powerful anti-oxidants (think anti-aging & anti-cancer), protect our cells from free-radical damage, enhance immune function, increase cell to cell communication (vital for healthy cell function and growth), and also play a vital but yet unexplained role in reproduction. Tomatoes also contain another group of pigments known as flavonoids (specifically, naringenin, chalconaringenin, rutin, kaempferol, and quercetin). The tomato’s flavonoids have been found to have a positive effect on weight balance and perhaps even prevent obesity, in addition to protecting the liver, preventing DNA damage from free radicals, are powerful anti-oxidants, and anti-inflammatory agents. Tomatoes also contain hydroxycinnamic acids (caffeic, ferulic, and coumaric), which are non-flavonoids phytonutrients. These incredible natural acids have been scientifically shown to block the harmful chemical compounds (N-nitroso) which are part of the cancer causing process. Another phytonutrient in tomatoes belongs to the saponin category and has been shown in human studies to inhibit the accumulation of cholesterol and to reduce the blood levels of cholesterol, triglycerides, and LDL (the “bad” lipid). Overall, the tomato easily makes the Superfood list, and has been linked specifically to reducing the risk of prostate cancer, breast, digestive, cervical, bladder, and lung cancers. The tomato succeeds by interfering with a cancer cells’ ability to grow and reproduce, as well as stimulating our bodies’ ability to defend itself against cancer and other diseases. The tomato’s powerful antioxidants block free radical damage which makes them great anti-aging & anti-inflammatory agents in addition to their ability to protect and preserve against heart disease. So which tomatoes are best? Tomatoes are one of the few fruits or vegetables which has an increased amount of nutrients when it is cooked. Tomato sauce has 2 to 8 times the amount of available lycopene as raw tomatoes, and it is in a form that is more readily absorbed by your body. And generally the smaller the tomato, the greater the antioxidant punch. This is true of most fruits because much of the antioxidants are contained in the skin, so the greater proportion of skin to flesh, the higher the amount of antioxidants. 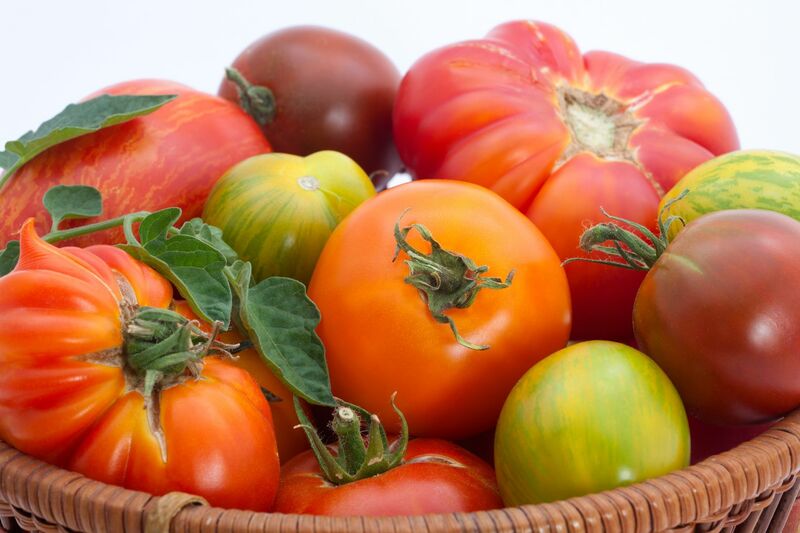 So grab a beefsteak, whip up some marinara sauce, or snack on the sweet grape or cherry tomatoes today!